My apologies for the long delays between posts, I was sidetracked by some Greek music projects and summer vacation. So, without further delay, here is the first of a short series of records from Vietnam. This record was recorded in 1927 for Victor’s 40000 series, a mysterious group of recordings from Indochina, as it was then called. I have yet to find any solid discographical information on this series aside from a mention of the above dialects in an old Victor catalog (thanks to Du Jun Min). This series is followed by the 42000 series of Chinese (mostly Cantonese) records. This is a hat cheo theater song, Tả cảnh cô đầu thua bạc (describing a singer who lost her competition). The genre is cheo cai luong (reformed cheo theater), the singer is Dao (Ms.) Nha, and the place is rạp Cải Lương Hý Viên Hanoi (the Cai Luong Theater of Hanoi). (Hat Cheo is an ancient form of vernacular theater from North Vietnam that reached it’s peak in the 19th century. It includes satire, songs, dances and skits. Please have a look and listen at Excavated Shellac’s current post from Laos! Good to see you back. This is a beauty! great to have you back posting! was terry able to translate any of the lao records? Always Nice to see your posts, this one particularily beautiful! I would love to hear the flip-side as well I look forward to your excursion to Laos and will be happy to follow your blog again! “Tả cảnh cô đầu thua bạc” translates as “Describing The Scene of the Songstress Losing At Gambling.” The rạp Cải Lương Hý Viên was located at the corner of Hàng Bạc and phố Tạ Hiện in Hà Nội. This must be an actress from Trần Phềnh’s troupe. Where do you find these recordings? If you have any more Vietnamese sounds, please post them. “thua” in this case means “to collect or gather” referring to the moment the performance ended and the “cô đầu” circles the spectators collecting money. Please disregard the above correction on “thua.” The translation by Professor Miller is correct. 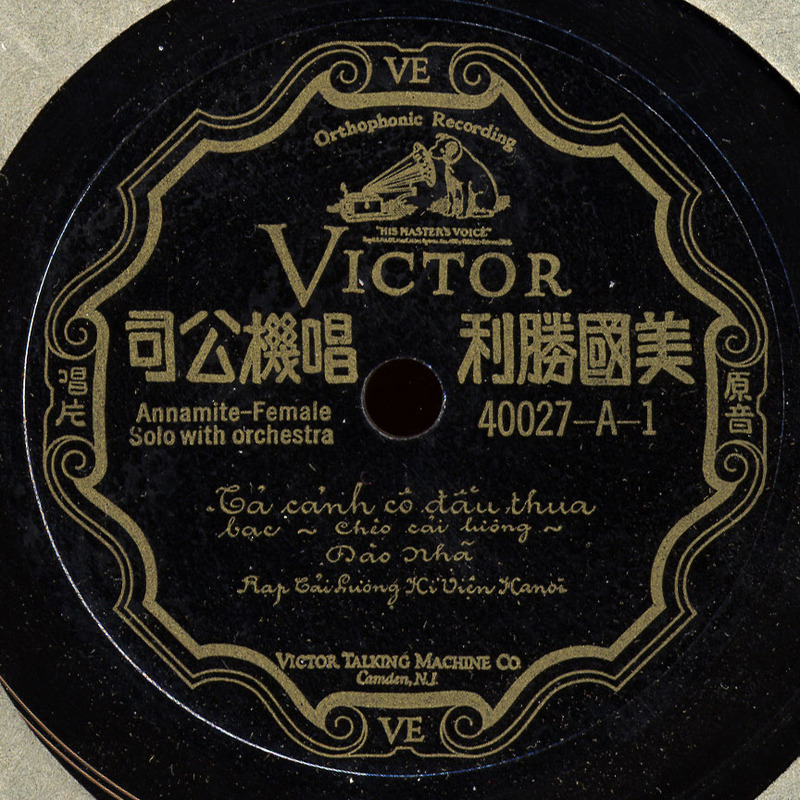 The first line on the record with “…canh nao cung thua” favors the the “gambling” connotation.